There are numerous ferry crossings operating from Batam to Singapore. Ferries currently connect 5 ports in Batam with 2 ports in Singapore. There are a combined number of 85 ferry crossings each day across a selection of 7 Ferry Routes which are operated by 4 ferry companies including Sindo Ferry, Horizon Fast Ferry, Batam Fast Ferry & Majestic Fast Ferry with the shortest crossing taking around 50 minutes (Sekupang to HarbourFront Centre). This is a general summary of the services on offer between Batam and Singapore, for live information select from our Fare Search. Found just 20 kilometres south of Singapore, the island of Batam is Indonesia’s industrial hub and is fast becoming a top tourist destination. Batam City is the 8th largest in the country and offers great shopping opportunities, with a large number of bustling markets selling an array of goods. It also boasts some excellent golf courses and a vibrant nightlife, attracting a growing number of visitors each year. 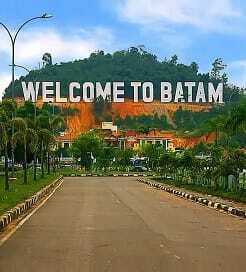 However, amongst tourists, Batam is primarily used as a gateway to Singapore and then onto Malaysia. The island also a good location for a stopover if you’re travelling through Indonesia. Due to their proximity, travelling by ferry is the quickest and most convenient mode of transport to Singapore from Batam. There are a few ports along the north coast offering numerous crossings to Singapore’s Harbourfront Centre and the Port of Tanah Merah, further east along the coast. Located in Southeast Asia, Singapore, is a sovereign city state and island country and lies off the southern tip of the Malay Peninsula. With a land area of about 710 square kilometres, Singapore is one of the smallest countries in the world and the smallest in the region. Although small in size, Singapore manages to command an enormous presence in the world today with its free trade economy and highly efficient workforce. 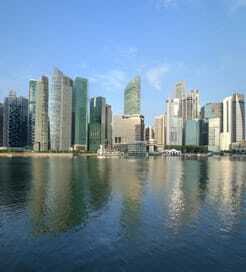 Singapore is a bustling cosmopolitan city of high-rise buildings, landscaped gardens and heritage-rich precincts. Home to a harmonious blend of culture, cuisine, arts and architecture, Singapore is rich in contrast and colour. In fact, you would find that Singapore embodies aspects of both East and West in many interesting ways. Singapore’s population stands at around five million and English as the main language of instruction, and a mother tongue for each major ethnicity. Being a multi-racial society, Singapore is as diverse as it is harmonious. With so much to see and do, this is perhaps best experienced through your encounters with the locals.